Yesterday was a very interesting day of sorts. I had a busy day planned, but things fell into place in ways I wasn't expecting. A sweet friend brought me a very exquisite gift. I don't know that I can convey how much it means to me. She served a church mission in Bulgaria, and later married a man from there, and he joined her in the States. 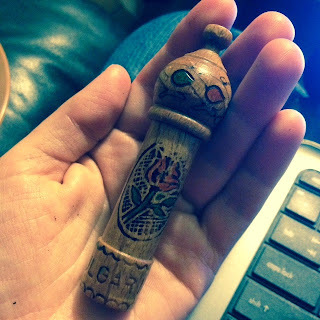 When she came to visit me yesterday, she brought me a small vial of Bulgarian Rose oil, held in a Bulgarian Muskal. There is a lot of grey area in the world of essential oils. I'm really not much of an expert in this area, however I understand minimal basics. To purchase a vial of 100% absolute is very expensive. The company I work with values a 5 mL bottle of their Bulgarian Rose Absolute at over $375. However they don't sell it; they offer it as a sales incentive to those who reach a certain level of sales. I am not keen on stressing over those things, so I have never earned it. However my friend bringing me this Muskal with Rose Oil in it is more valuable to me than had I done the work to earn the more potent version, because there is friendship attached to it. It is a true, heartfelt gift, which words cannot describe. Rose is well known for being one, if not the highest vibrational oil on the planet. Symbolically it represents Divine Love, and helps one connect in feeling that Diving Love. (See Emotions & Essential Oils for more info.) Tonight I used it as inspired, to assist my efforts in clearing out negative influences, and the felt the Savior cleanse my body. It was certainly something I would consider anointed oil.